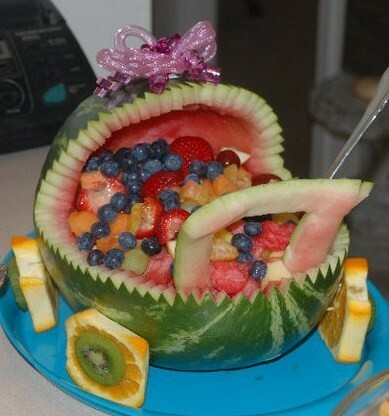 This Fruit Bowl Baby Carriage is the perfect centerpiece for a baby shower. Use a knife to cut only part of the top of a watermelon. 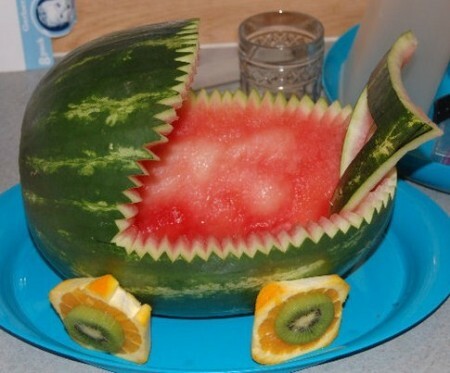 Scoop out the watermelon insides, and cut into chunks. Cut a jagged edge on the carriage body. Take cut part of the rind to make the carriage handle. Use orange slices & kiwi for the wheels. Attach with tooth picks. Fill carriage with watermelon chunks, fresh berries, and any other fruit you want. What a clever idea. Looks fantastic. So cute! A lot of work cutting so neatly around the edge... nice job.